Enjoy all-day admission to Ocean World in Puerto Plata. 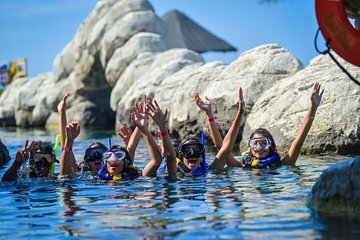 Explore the Caribbean's largest adventure park and take the opportunity to learn about sharks, sea lions, stingrays and dolphins. Walk through the park's rainforest, catch a glimpse of the tropical birds. This family-friendly outing includes hotel pickup and drop-off in Puerto Plata. After pickup at your hotel in Puerto Plata, enjoy the short ride to Ocean World, the Caribbean's most extensive adventure park. Spend the day at Ocean World however you choose. Attend the dolphin, sea lion or tropical bird shows. Swim with sharks in their natural habitat, and snorkel above a coral reef populated by colorful tropical fish. Learn about each of these animals’ biology and behavior from the park's expert trainers and staff. At the end of your day exploring Ocean World, enjoy drop-off at your Puerto Plata hotel. What a great experience for our family. It was door to door service on a comfortable air conditioned bus. Ocean World was well designed and clean, with a variety of shows and experiences for all. We especially loved the Pirates Pool. Lunch buffet had a variety of foods. Thanks for a wonderful family day out. Very well organized and executed tour. Very low key place to visit. A very relaxing an enjoyable experience. Well worth the price. The shows were timed perfectly so you could attend all shows throughout the day and still have time to enjoy the site without being rushed. Our time spent at Ocean World was good. The shows were all entertaining and informative. The animals all seem to be cared for really well. Ocean World is very clean and a pretty place to see. The tiger exhibit was awesome. The bus ride there and back was good. There were no problems with the pick up or drop off. The bus was on time each way and the tour guide was very friendly and informative. He spoke english very well. The only complaints that I would have would be involving the food and the dolphin encounter which my daughter took part in. If you do not participate in one of the animal encounters your buffet lunch is not included in your price, when still the buffet lunch was not worth it. The lunch costs $14 per person even if you only want a sandwich or fires and a drink. It is the same price regardless of what you get, it is a buffet and there is no other options. The food in the buffet was not very good at all, my daughter would not eat hardly anything, she said it all tasted disgusting. I would suggest not eating there, just eat a big breakfast before you leave your resort and then wait to eat supper when you get back. The other complaint is that family members are not allowed to go watch the dolphin encounter or any dolphin swim program. Ocean World does not want any outside pictures taken of the encounters/programs. They want you to purchase their pictures so they do not allow family members to go watch. I was really disappointed that I could not go watch my daughter have a dolphin encounter, this was an experience of a lifetime, I couldn't go share. Fantastic! We particularly liked the trained dolphin, seal and bird shows - very entertaining. Visiting the love birds in the cage was a special treat too. Thank you Ocean World for making our vacation one of the best. First visited Oceanworld 3 years ago it made that much of an impression that we chose to return this year yet again absolutely amazing ....dolphin swim was as popular as ever and a different routine to last time ....our personal favourite were the tigers a wonderful sight to see . All animals are looked after brilliantly,staff are very genuine and caring . However not as busy as previous which for us was great but hope this is not a trend that will continue . An absolute must see also the Bravissimo show and dinner fantastic also returned specifically to do both these activities . Value for money -superb although booked 2 dolphin swims on arrival which did work out very expensive ...good advice book dolphin swim before you go. Very clean park with lots of things for all ages to do!